10 – The Mueller investigation will continue throughout the year, and might not even finish before the year is over. Trump will not be indicted, however it is possible that one of his sons, or his son-in-law will be. If that indeed happens, Trump will issue a pardon(s), setting up a messy confrontation with Democrats. In other words, the turmoil surrounding the Trump Administration and the Russia investigation will continue unabated. 9 – Despite making gains, the Democrats will fail to win the majority of seats in the House of Representatives, and Nancy Pelosi will be replaced as Minority Leader (this might actually not happen until early 2019 when the new Congress is seated, but its inevtibility will become apparent soon after the election). The Republicans will slightly increase their majority in the Senate. The map highly favors the Republicans (with more Democratic seats up), so even though the majority will increase, it will not seem like a victory because they will not win as many seats as they could have. 8 – The Republican party will continue to splinter, and the primary season will be very ugly with numerous in-party challenges. The Democrats will struglle internally as well, as the liberal wing (led by Warren and Sanders) will contiue to buck the rest of the party. This latter divide is another reason why the Democrats will be once again be the minority party in both Houses. No clear Democratic candidate for President will emerge, leaving both parties in dissaray at the end of the year. Political turmoil continues. 7 – If tax reform doesn’t pass by the end of this year (which it probably will but just had not when this was posted), it will pass early next year, but no major infrastructure or other significant legislation will pass in 2018, as election year gridlock will begin earlier than usual. The Republicans will cite Democratic obstructionism as their election cry while the Democrats will highlight the lack of Republican legislative successes. Get ready for a fun Fall! 6 – Despite rampant speculation at the end of the upcoming Supreme Court term, Justice Stevens will not retire. Short of an unexpected death, Trump will be denied another Supreme Court nomination next year. 5 – On the international scene, there will be elections in the U.K as the May government will fall as negotiations over Brexit stall and get contentious (this prediction was written before the recent set back when Parliament bucked May and legistated that it must okay any final plan). Merkel will put together a coalition and remain as Chancellor in Germany. There will little to no progress on Middle East peace and Assad will remain in power in Syria. Tension with Russia will continue, and I wouldn’t be surprised to see Russia get more involved in Venezuala, filling the void created by the current political vacuum. 4 – With ISIS lossing most of its land, there will continue to cause havok with lone wolf attacks across the globe; trucks/cars will continue to be the weapon of choice. While the odds of a second Arab Spring have increased with Trump’s decision to recognize Jerusalem as the capital of Israel, it will not happen and the protests will dwindle over time. The odds are good that Trump will pull out of the Iran nuclear agreement when its recertifaction comes due, further alienating the U.S. from its allies (following the withdrawal from the Paris Agreement and the declaration to move the U.S. embassy in Israel to Jerusalem). 3 – For financial services, the biggest threat to stability is the current Bitcoin mania. Nothing was able to derail the market in 2017 – not North Korea, terrorism or Trump’s tweets. I have little doubt that the Bitcoin bubble will burst, the real question is if it will cause any large scale sytematic reactions. At this point, I am going to say that it won’t and that as people realize the dangers of Bitcoin and perhaps calls for regulation increase, and become closer to reality, cool heads will prevail and realize that it is an isolated incident and not part of a larger problem with the financial system. 2 – Despite the political gridlock, given the positive trajectory of corporate profits, the market will continue to do well. However, there will be a correction of at least 10% at some point during the year, and while the major indices will end the year in positive territory, it will be single rather than double digit gains. Emerging and European markets will rise about the same as the U.S. markets. Technology will lag the overall market while financials will lead. There will only be 2 interest rate hikes – not 3. 1 – And turning to sports, the Olympics in South Korea will go off withoug a hitch, despite the worries over current tensions with North Korea. Clemson will win the NCAA football national championship, beating Oklahoma. The Patriots will beat the Vikings in the Super Bowl. (I know – I probably just jinxed them!) Duke will win the NCAA basketball championship, Tampa Bay will win the Stanley Cup, the Warriors will repeat as NBA champions and the NY Yankees will win the World Series. As the year draws to a close, many of you are finishing your 2018 business plans, and many of these plans probably include at least one new hire. And for those of you not planning to add to your team in the near future, we all know that circumstances often change – and quickly. The hiring process is complex, and more than just finding and hiring a qualified candidate; there are a lot of people that have the credentials and backgrounds to fill most positions. BUT the key to success is finding a qualified candidate that matches your company culture. Finding the right fit – the first time – is what differentiates Your Hiring Partners (YHP) from the competition. Our pledge is to deliver highly qualified candidates that match your company culture. First, our process, which includes a proprietary grading system to save your company time and money and relieve your HR department/employees of the time, frustration and stress of combing through hundreds of resumes. We offer a free consultation and begin each search with a mini 360 evaluation to collect details about your people and processes, as well as the specifics for the job that you are hiring for. We also offer on-boarding as part of our hiring processs, so that we can guide you with best practices to increase the odds of long-term success between you and your new employee. Second, my partner Petey Parker and I have over 60 years of combined business and consulting experience, and cultivated deep networks of contacts which we leverage and use to supplement the other traditional search techniques that we utilize. We conduct searches throughout the country, and I specialize in the financial services industry. Now that Donald Trump has become president, and now that we have seen him in action for a number of months – both before and briefly since the inauguration – you are sure to continue to get client questions about what a Trump presidency means for the stock market and their portfolios. If you aren’t getting these questions, you may want to bring up these issues yourself. Why? Because it’s inevitable, market fundamentals aside, that the president and his actions are going to have a significant impact on the financial markets this year and into the future. Better to get ahead of the discussion than have to answer unexpected telephone calls. Politics aside, I think it’s fair to say most people would agree Donald Trump is going to be an unconventional president. Whether it be his focus on “the deal,” his seeming willingness to break with long-standing traditions (such as speaking by telephone with the President of Taiwan) or his tweeting at all hours of the day and night, the contrasts in style with former presidents are easy to see. What is not so easy to determine yet is how successful he will be in implementing his agenda and how the markets will react. In the few days he has been in office he has begun to make good on a number of his campaign promises, and has met with a number of business and union leaders emphasizing his “business first” approach. Yet at the same time, unexpected reactions to issues such as the size of the crowd at the inauguration and potential voter fraud may have some people shaking their heads. As such, I think you should prepare clients for a volatile 2017. The highs might be higher – as they were a few weeks ago with all of the major indices reaching records and more recently this week with the Nasdaq and S&P 500 reaching new highs – but the lows may also be lower. Take for example the effect Trump has already had on an entire sector – biotechnology stocks – when he tweeted that drug prices were too high and on individual companies – Boeing and Lockheed Martin – when he tweeted that their government contracts were too expensive. It seems inevitable that Trump’s tendency to challenge the status quo and stir the pot will have similar effects on the entire market. Fundamentals will of course have a large role in how the market does as well. Will corporate profits continue to rebound? Will the price of oil stabilize? How successful the new administration is in passing some of its legislative priorities, such as a large infrastructure spending bill, corporate tax reform and changes to Obamacare will also be important. Taken together, you can see that a very long bull market (the second longest in history) has many obstacles facing it – both known and unknown. And we haven’t even talked about the global forces that might impact the markets, including Brexit and the rise of nationalist parties in Europe, or the threat of global terrorism. So what are the bottom line implications of a Trump presidency for your clients? Should they change their investment strategies? Should they exit the market and wait and see what happens? The answers to the last two questions are of course no, and it’s your job as an advisor to provide reassurance and levelheadedness. While some of the challenges facing the market may be new, the fact is there is always uncertainty facing the market. And history has shown that what works is a diversified portfolio individually customized for each client’s long-term wealth management goals. Let’s not forget the market began last year in a month-long free-fall that was reversed before the end of the first quarter. 2017 is shaping up to be an interesting and volatile year for sure. As long as clients are prepared for this volatility and recognize that it is being caused by short-term events rather than longer-term seismic shifts in the fundamentals underpinning the market, they should be able to sleep better and you will have done your job. Will AUM-Based Fees Or Retainers Rule The Day? With the Department of Labor’s (DOL) new Fiduciary Rule set to begin in April, there is a debate brewing over whether the more traditional asset under management (AUM) based fees or retainers will win the day moving forward. Clearly, under the best interests rule for retirement, advisers will be moving away from charging commissions and gravitate toward fees. The question is, what is the fairest and most defensible way to charge clients? Historically, and still today, an AUM-based fee is the most popular. Clients are charged a fee based on an annual percentage of their assets under management – often declining as asset levels increase. A big selling point to this type of fee has always been that it puts the advisor on the same side of the table as the client, with everyone having an incentive to see the assets grow. Retainers, however, are starting to become more popular, and some industry experts are beginning to champion them as being fairer to clients, and easier to defend. Retainers are often determined by a client’s net worth and income. Advocates argue that there are fewer potential conflicts of interest with retainers, and that it will become increasingly more difficult to show that a recommendation is in the client’s best interest when the advisor’s fee will depend on whether it is acted upon or not. For example, let’s say that a client asks an advisor whether or not they should roll over their 401(k) into an IRA managed by the advisor when they get a new job, or leave it at as is. Obviously, the advisor will not earn any compensation if the funds stay at the employer, so they are put in a position where they have to demonstrate that moving it is in the client’s best interest – easier said than done! There is no such conflict under a retainer agreement, however, as the advisor is agnostic where the assets are actually managed. On the flip side, retainers might be hard to justify for client’s with fewer assets, as they would pay much more under a typical retainer relationship than they would under an asset-based fee. The argument is just beginning, and will continue for the foreseeable future. One thing for sure is that asset based fees are not going away, as they do qualify for the “level-fee” exemption under the fiduciary rule as long as certain fiduciary disclosures are made. It will be important for advisors to clearly articulate to clients and prospects what their fee is, how it is calculated and why they have chosen that particular method. Some advisors might choose to offer clients a choice. Regardless, going on the offensive and being proactive in discussing fees will become more important than ever. If you don’t discuss the issue thoroughly, you will be at risk of losing clients. The growth of Unified Managed Accounts (UMA) has been well documented, just as the death of Separately Managed Accounts (SMA) has been greatly exaggerated. There continues to be room for both among the many advisory options available at most firms. But often overlooked in the UMA v SMA fight is what I’ll call the staggering growth of Rep-as-PM programs. 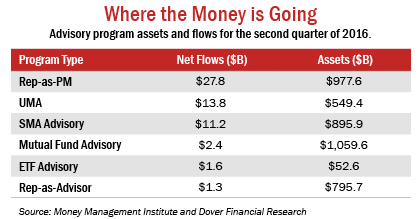 In fact, as you can see from the table below, these programs now exceed SMA advisory assets and are quickly about to replace mutual fund advisory assets as the largest in the group. ETF advisory programs are relatively new, but they will continue to grow – most likely at the expense of mutual funds. Frankly, this large growth in Rep-as-PM assets scares me. I know many advisors who are true managers – they have research and portfolio management experience, dedicated staff to the process, etc. – and in many cases they add significant value to their clients. I worry about others, however. As downward pressure continue on fees, how many advisors have made the decision to go this route so that they can keep more of the fee as opposed to “giving” it up to outside managers? How many have taken the time to truly master the art of portfolio management in what is a very difficult investment environment? I have often argued that it is difficult for advisors (or advisor teams or RIAs) to do many things well. It is hard for example to market, and grow your business, if you are truly acting as a money manager (unless you have hired staff to assist you). Many successful advisors see themselves as relationship managers first, and are happy to delegate the management to outside firms (even if they get a smaller fee). In addition, let’s not forget what happens in bad markets, and when you underperform – because at some point, you will! In the Rep-as-Pm scenario, the client has only person to blame and potentially fire – you. If you use outside managers, or even funds, you can often times convince the client to change managers rather than get rid of you. Finally, what will happen to these programs and advisors under new fiduciary standards? At the end of the day, advisors would be well served to make sure that whatever advisory programs they use serve clients the best while fitting into their own business model. I hope my concern over the grow of these programs is unfounded; only time will tell. If your answer is yes, you’re probably not alone. 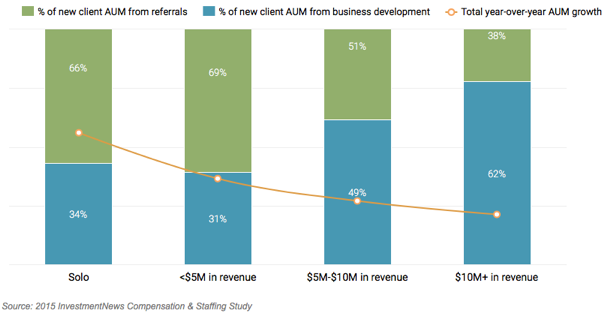 In its most recent annual benchmarking study, InvestmentNews found that as advisory firms grow, business development (prospecting and marketing) becomes increasingly important for the most profitable firms – often times, as depicted below, at the same time that referrals take a lesser role. Another conclusion reached by the study is that many firms begin by growing through referrals, but the most successful ones then master how to continue their grow through business development. But interestingly, the study also show that the most profitable firms at all stages of growth are those that rely less on referrals than their counterparts. Finally, the study showed that the top performing firms spend 50% more on their business development efforts than their peers. This study is consistent with other studies that I have seen lately which show that high net worth individuals are becoming more reluctant to make referrals. The bottom line lesson here is that reliance on referrals only – while maybe an acceptable practice in the past – is becoming increasingly difficult. It’s 2017 business planning time – consider taking the time to clearly define your target markets, make any necessary adjustments to them and develop a marketing plan that focuses on more proactive client acquisition. Don’t stop asking for referrals; just stop counting on them. I was asked to write an opinion piece for efinancialcareers.com on how the U.K.’s vote to leave the EU would impact global hiring in the financial services industry. As with most major international events, there will be winners and losers within the financial services industry as things shake out. However, employers do not like uncertainty, and there is a lot of uncertainty at the moment, so hiring for now will slow as employers take a wait and see attitude. In fact, neither the shorter- or longer-term implications of the Brexit are known at this time, as the process has not even begun and could take more than 2 years. British politics is in turmoil, as it looks like the leaders of all three major parties will be replaced, and the British Pound has dropped to a 30-year low versus the U.S. dollar. While world stock markets have recovered from their initial shock, expect continued volatility through the usually slow summer and into the lead-up to the U.S. election in November – which itself is shaping up to be another wild card. Click here to read the entire article and potential financial services winners and losers from the Brexit. Over the past few years, billions of dollars have been invested through Robo-Advisors, a relatively new type of internet-based investment intermediary. These automated systems offer investment management (and in some cases financial planning) at dramatically reduced fees by cutting out the middle man – the traditional broker/advisor. Should the multi-trillion dollar advisory industry view robos as a business threat? Or should advisors view their emergence as an opportunity? We believe that rather than fight the robo-advisor trend, advisors will be better served by incorporating the philosophy into their business as they see appropriate. Want more details? Click here to see the entire White Paper.